Tagline: First it was teacher to student. Then it was father to son. Now, it’s man to man. The mark of a good sequel is that it offers elements which are new and rewarding. The first Karate Kid movie was one of the surprise hits of 1985, one that famous critic Roger Ebert correctly predicted would earn itself a Best Supporting Actor nomination at the 56th Annual Academy Awards ceremony, much to the mocking delight of fellow reviewer and long-time competitor Gene Siskel. 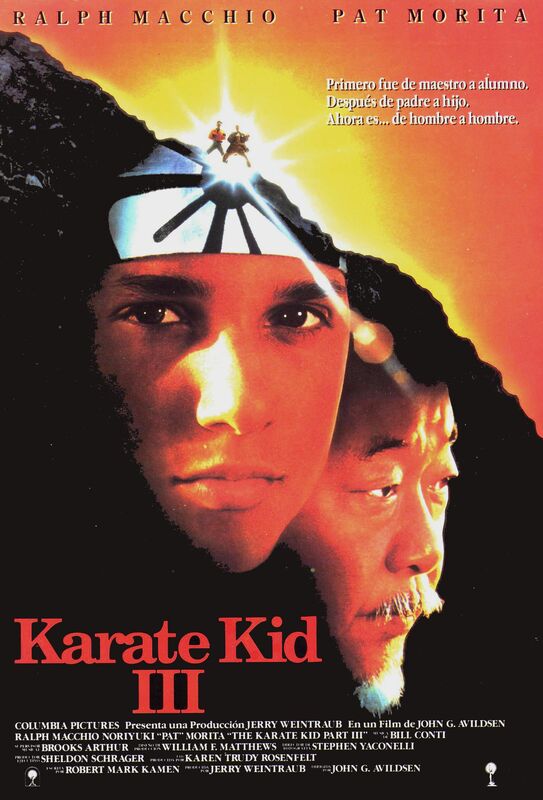 In spite of its hokey title, The Karate Kid is a gem of a movie, the story of bullied teenager Daniel Larusso (Ralph Macchio) and his unlikely friendship with surrogate father figure Mr Miyagi (Pat Morita), an apartment complex handyman who uses marital arts to teach his student the values of life. The success of the movie guaranteed a big-budget sequel, but while The Karate Kid Part II lacked the freshness and underdog spirit of the original, it featured great locations and immaculate staging, allowing us to learn more about Miyagi’s past and how he evolved into the sagacious marital arts master we would grow to love. It showed the almost mystical figure’s human side, and ultimately brought the two characters closer together. Come on, Daniel. You can tell me. I mean, how old can you be? By the time The Karate Kid part III hit the screens Ralph Macchio was 28 years old. No longer the dimpled, adorable type squirming in the armlock of adolescence, an overweight Macchio was finally beginning to show his age, and the dynamic of the movie was doomed as a consequence. Add to this a ludicrous story, forced moralities and a contrived screenplay which only served to sully the integrity of its characters, and you’re in for a thoroughly dissatisfying end to what could have been one of the finest trilogies of the decade. After the heady events of his homeland return, Miyagi is facing joblessness and bankruptcy until a typically loyal yet irrational Daniel sacrifices his college fund to realise his longtime mentor’s dream: to own his own Bonsai store — a project which anyone with a modicum of business sense would tell you was doomed to failure. The original Mr Miyagi would never have been so short-sighted, especially with the future of his student on the line. He’s just spent the best part of the ’80s teaching Daniel responsibility, and now he’s willing to raid his piggy bank for a run-down store specialising in niche products. I mean, really? Like another famous wise man before him, Mayagi had a dream – an utterly foolish one. If the second movie was guilty of staying a little too close to the original’s formula, then Part III is little more than a cynical rehash. As you can no doubt imagine, Daniel is soon flirting with a token squeeze — a Tiffany lookalike named Jessica (Lively) who looks ten years younger than Daniel, resulting in an onscreen romance that comes across as a little bit icky. Jessica runs a store across the street, which coincidentally specialises in painting plant pots, a fact that gives the terminally precocious Daniel a quite staggering idea, one that I won’t waste your time elaborating on. With the aid of a few crappy tables and flimsy Japanese decorations, the store is soon up and running, and with the dynamic of our dysfunctional family developing nicely, all is well for our favourite duo. They should have known better. It seems our favourite duo can’t turn a corner without getting mixed up in some karate-related drama, and we soon discover that Miyagi is not the only one who has fallen on hard times. After his appalling behaviour following the All Valley Karate Championship, former enemy and Cobra Kai Dojo owner John Kreese (Kove) is ostracised from the community, losing his business and resorting to alcoholism as his ’80s edict of striking first fizzles without a trace. Luckily for him, former Vietnam buddy and megalomaniac entrepreneur Terry (Griffith) is there to lend a hand, funding an exotic oversees vacation for his friend in an effort to sober him up. Forget this! Let’s go find a bar and get wasted. Taking time out from his millionaire lifestyle and toxic waste dumping discrepancies, Terry sets about plotting the perfect act of vengeance, first by hiring hotshot fighter Mike Barnes (Kanan) to antagonise Daniel into defending his title, and then by trying to exploit Daniel and Miyagi’s relationship by becoming the confused Larusso’s mentor after a moralistic Miyagi refuses to train his former student. It is here where the movie begins to pack a certain amount of punch, particularly when Terry introduces his own violent and brutal training sessions, in which he manipulates Daniel into striking himself bloody, a routine of self-harm that he can only keep from Miyagi for so long. Griffith puts in a colossal turn as the sneeringly malevolent Terry; the only bright spark of a decidedly low-key sequel of largely listless performances. Also worthy of a mention is Kanan as the latest hothead to test LaRusso’s resolve, but would Daniel really fall for his and Terry’s ploy after all that Miyagi has taught him? For the once great man’s sake, you would certainly hope not. You’d think Global Entrepreneur Terry would have more pressing matters to contend with than Daniel Larusso. After single-handedly taking on Terry, Kreese and Barnes in one of the few scenes which utilises Morita’s wonderful comic abilities, Miyagi inevitably agrees to train his protege and the old dynamic is vaguely rekindled in a rushed sequence which fails to capture the trademark magic of previous instalments. But where the movie really falls flat is the not-so-grand finale, a lifeless karate event which ditches the Japanese symbolism for a hollow victory that smacks of a cash cow drained within an inch of its life. Abandoning the teachings of his longtime mentor and father figure Mr Miyagi, Daniel proceeds to smash his knuckles into mincemeat by aggressively attacking solid wood for almost half of the movie. Have you learned nothing, lad? After turning his foot into a side of roast beef, a hobbling Daniel is advised by Miyagi to submerge it in a dubious neon green potion, causing it to heal overnight. Ah so, Daniel San! Me sow solly! Exasperated with Miyagi’s unwillingness to train him, Daniel offers a little wisdom of his own. Daniel: You know, this is the 80s, Mr. Miyagi. You can’t be so damn passive! A low-key, low-budget conclusion to what began as a wonderful tale of morality, honour and friendship, there is little to distinguish The Karate Kid Part III as a notable entry in the franchise, and though there are embers of the old magic, this is a lazy, money-fuelled instalment which ultimately serves to detract from all that went before.